Clove Oil has such an exotic smell. Often in our society associated with Christmas…or toothache!!! There is a good reason for it being associated with toothache. 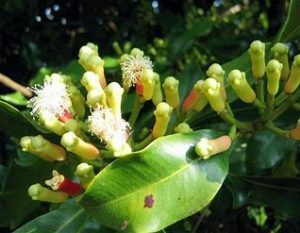 It is because Clove is a powerful antiseptic and has pain relieving properties. Clove Oil can be used as a digestive aid, especially when treating nausea and vomiting. It can be blended with a base oil and rubbed onto the tummy and around the neck to help relax the muscles. It is also considered that chewing on a clove bud can help ease sore throats and the oil is helpful in easing breathing problems such as coughs, colds, sinus issues and asthma.